the Honorable Minister of State for Railways in the recently sworn in Modi cabinet, Govt. of India. 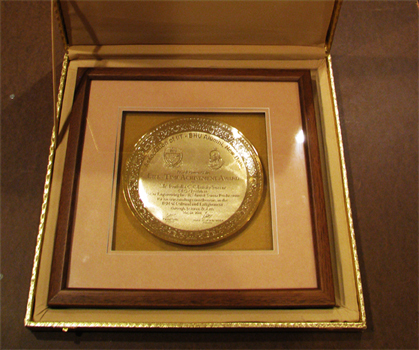 The Alumni Association of IIT-BHU (Indian Institute of Technology-Benaras Hindu University) conferred the Life Time Achievement Award 2013-14 on Manick Sorcar on this day at their 8th Annual Conference held at the PHD Chamber of Commerce, PHD House, 4/2 Siri Institutional Area, August Kranti Marg, New Delhi, India. 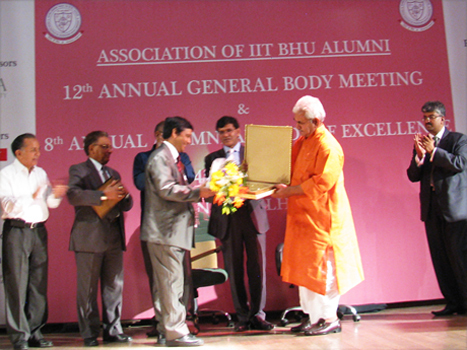 The citation, plaque and flowers were handed by Sri Manoj Sinha, a three-time elected Member of Parliament from Gazipur, U.P., now the Honorable Minister of State for Railways, Govt. of India. The 8th IIT-BHU Alumni Awards of Excellence were chosen by an eminent jury comprising Mr. M. K. Modi (CMD Modi Group), Mr. Deepak Pahwa (CMD Pahwa group), Prof B. B. Dhar (ex-Professor IT BHU, ex-Senior Vice President, Amity University), Dr. R. P. Singh (ex CMD Power Grid Corporation of India), Mr. Raman Sidhu (Chairman, European Business Group and Head-PSU Coverage at Deutsche Bank AG), Dr. Dhananjai Pandey (Professor, School of Material Science and Technology), and Mr. Shivakumar (Chairman & CEO, PepsiCo India). 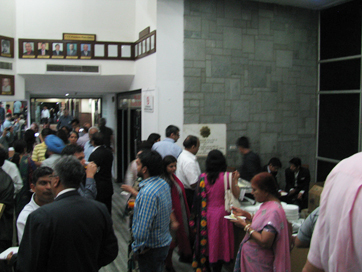 Under the Chair of industrialist Mr. M.K. Modi, the jury unanimously selected Sorcar for the IIT BHU Alumni Life Time Achievement Award for the year 2013-14 for his "long outstanding contributions in the field of Cultural and Enlightenment through Science and Arts". 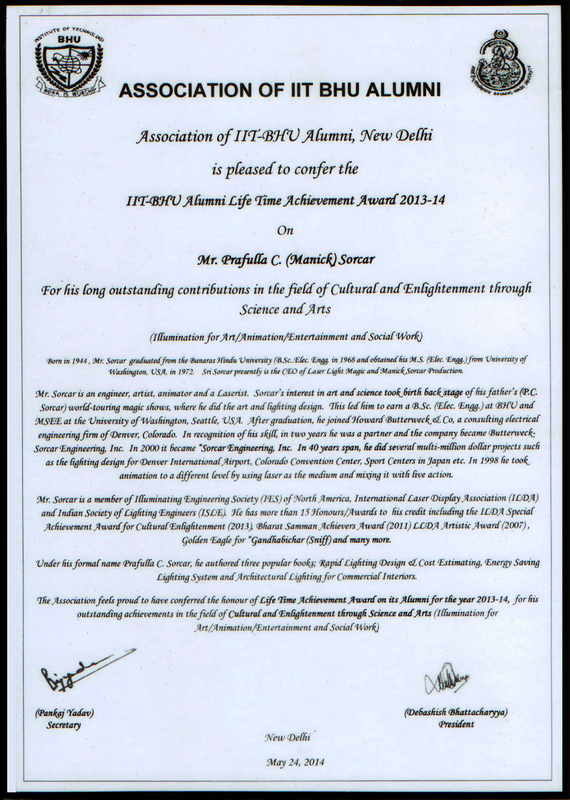 "Association of IIT BHU Alumni, New Delhi is pleased to confer the IIT-BHU Alumni Life Time Achievement Award 2013-14 on Mr. Prafulla C. (Manick) Sorcar for his long outstanding contributions in the field of Cultural and Enlightenment through Science and Arts (Illumination for Art/Animation/Entertainment and Social Work)". 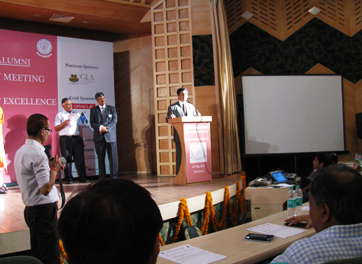 (signed: Sri Pankaj Yadav, Secretary, and Debashish Bhattacharyya, President). 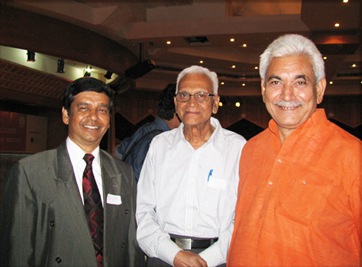 and Sri Manoj Sinha, M. Tech (Civil) from IT-BHU, MP, Honorable Minister of State (Railways), Govt. of India. During his acceptance speech Manick said, "I am humbled by this award, which I attribute to two great sources that made it all happen. The first is my father, the Late P. C. Sorcar, who kindled the fire in me to combine science with art. I had my hands-on experience back stage in doing the intriguing lighting and art design of his world-touring magic shows. It was so fascinating that I fell in love with it a lot more than doing magic shows on stage. And the second is BHU, my alma-mater, the all-time great university, which set the foundation for all the technical knowledge I needed". Founded in 1919, Indian Institute of Technology (BHU), has a residential and co-educational campus built on an area of 400 acres within the larger BHU campus which is spread over nearly 1,300 acres (5.3 km2) at the southern end of Varanasi on the banks of the River Ganges. In 1971, three faculties of BHU viz., Banaras Engineering College (BENCO), College of Mining & Metallurgy (MINMET) and College of Technology (TECHNO) were merged to form the Institute of Technology, Banaras Hindu University (IT-BHU). IT-BHU was designated as an IIT by The Institutes of Technology (Amendment) Act, 2012, which was passed by the Lok Sabha (House of the People or the Lower House) on 24 March, 2011 and by the Rajya Sabha (Council of States or the Upper House) on 30 April, 2012. 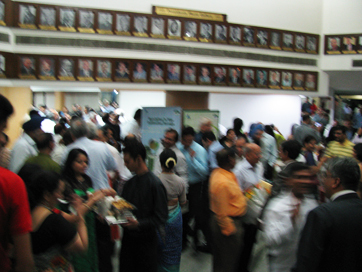 The President of India signed the Bill on 20 June, 2012 and was notified in the Gazette of India on 21 June, 2012. Under his formal name "Prafulla Chandra Sorcar", Manick graduated in 1968 with a First Class earning the Bachelor of Science in Electrical Engineering (BSEE) degree from then BENCO, BHU.